31 May – 02 JuneHall A2 / Booth 540Small components with a significant impact on efficiency and security Over 20 years of experience in the photovoltaic industry and more than 150 GW of installed capacity worldwide – a record that speaks for itself! With over one billion implemented original MC4 connectors, we can say in good conscience that we are specialists in pioneering contact technology and your expert contact for innovative and reliable complete solutions. As of January 2017, the well-known MC4 PV connectors from Multi-Contact, the brand for sophisticated connection solutions, now come from Stäubli Electrical Connectors. Multi-Contact took on the name of the Group, but the promise of high quality will remain the same even under the new name. 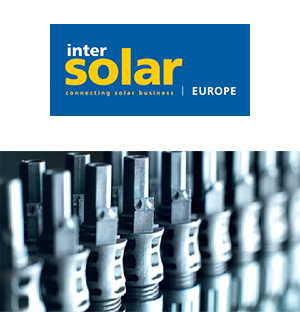 At Intersolar Europe 2017, Stäubli Electrical Connectors will present its impressive variety of products in their new guise for the first time. In order to keep up with customer requirements in the cable area, and to cover forthcoming requirements, Multi-Contact AG has launched a selection of new leads called Flex-Sol-Evo. The Flex-Sol-Evo leads, which feature stranded fine-wire core conductors and double insulation, stand out from their competitors thanks to their excellent quality. The efficient design allows for a compact installation through wiring of the panels at module level or the distribution boxes/inverters at string level. 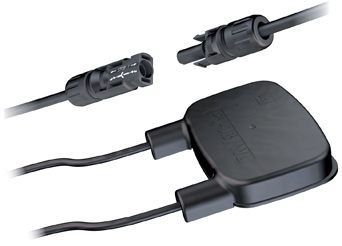 The Flex-Sol-Evo leads are covered by a range of different certifications, from the simple TÜV certification for 1 kV through to UL and EN certification for 1.
regarding Alleged “(Connector) Compatibility between PV Connectors from Different Manufacturers” A pioneer in the PV branch, Multi-Contact set the standard with its original MC4 connector, and over the past 20 years, over 120 GW PV power has been installed worldwide using this connector. However, there are numerous fakes or “copycat” Multi-Contact connectors on the market. It is often difficult to differentiate these from the original just by looking at them. However, technical comparisons show serious quality and safety flaws in the copies. It looks good, reliably conducts large currents, can be assembled on-site, and has received all of the necessary international certifications (IEC, UL, cTÜVus, JET, CSA) for use worldwide. The MC4-EVO 2 is the latest addition to the MC4 PV connector range, which has proven itself a million times over, and has just been launched by Multi-Contact on the global market. The new connector from the market leader for PV connectors has been approved for 1500 V DC (IEC, TÜV) and 1000 V DC (UL). The connector is extremely efficient, meaning that currents of up to 45 A can be transmitted with a cable cross section of 4 mm²/12 AWG, 53 A can be transmitted with a cable cross section of 6 mm²/10 AWG, and 69 A can be transmitted with a cable cross section of 10 mm²/8 AWG. During Intersolar Europe 2014 in Munich, the International Photovoltaic Equipment Association (IPVEA) elected new members to their board, including Multi-Contact's Eric Ast as their new president. Eric Ast, Global Business Development Manager Photovoltaics at Multi-Contact, replaces Sven E. Jarby from Oerlikon in the position of president of the IPVEA. The election took place at the association’s AGM during this year’s Intersolar Europe in Munich. 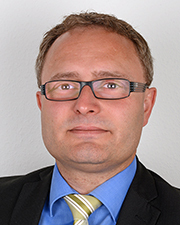 As of November 1st, 2013, Mr. Matthias Mack has joined the Multi-Contact Executive Board in the position of Global Manager Photovoltaic. 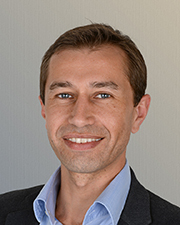 Mr. Matthias Mack, formerly Segment Manager Photovoltaic, has taken on a new position as Global Manager Photovoltaic at the company’s headquarters in Allschwil, Switzerland. 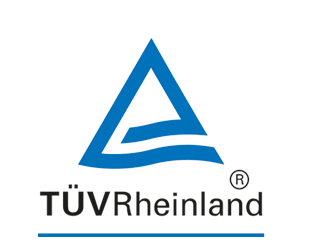 A rating increase to 1500 V TÜV has also been granted (for restricted applications). At Intersolar Europe 2013 in Munich, Multi-Contact, the leader in PV connectors, introduces a new name for their PV connector series. The pre-assembled cable sets, widely known as MC4PLUS, will from now on be marketed under the name „MC4-EVO 3“. 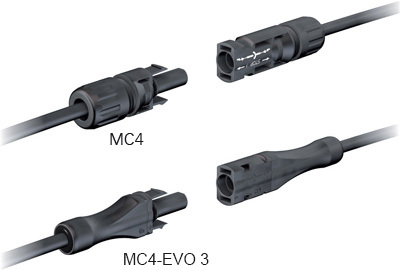 The MC4-EVO 3 products are compatible with the original MC4 connectors used worldwide, and are available with cable cross sections of 2.5, 4, and 6mm2. 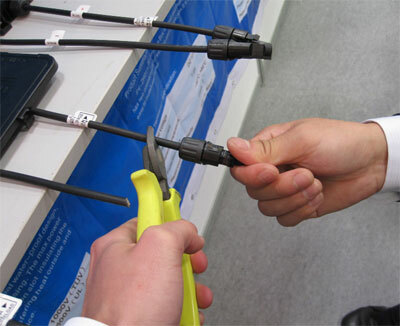 For the quick, safe and easy interconnection of Li-Ion battery packs Multi-Contact has developed a new, maintenance-free battery cable connector (BCC). The BCC has been specifically designed for applications requiring quick installation, maximum safety and minimum maintenance. It is for example suited for the use in battery storage solutions for renewable energies such as photovoltaics and wind power, or for the interconnection of battery packs in electric vehicles for public transport or mining. The easy to handle solution provides a high level of safety for the operating personnel in high voltage (300 V) and high power applications. 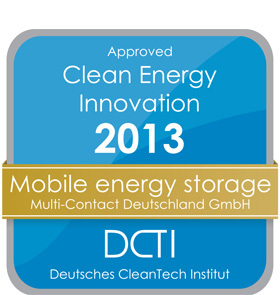 The idea of a mobile storage solution using connection technology by Multi-Contact was granted the “Clean Energy Innovation” Award by the DCTI (German CleanTech Institute). The concept presents an alternative to the network expansion, which may help relieve the power grid in a simple, fast and flexible way. Mobile battery storage systems, located in truck trailers or containers, are connected to the hub. This punctual relieve saves time and money compared to an extensive premanent network expansion, and helps avoid bottlenecks. In addition to the TÜV certification for a rated voltage up to 1000V, Multi-Contact’s junction box PV-JB/WL with vertical connection geometry (PV-JB/WL-V) has now also successfully passed the UL tests for up to 1000V. The installation of the PV-JB/WL is easy and safe, thanks to silicone assembly with prefixing tapes. They prevent the junction box from moving out of place while the silicone filling is drying. 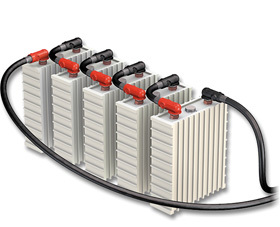 The vertical connection geometry meets the most common connection requirements of crystalline modules. Multi-Contact’s photovoltaic connectors MC4 and MC4-EVO 3 have recently been certified for protection class IP68. With the highly efficient, TÜV and UL certified connectors, the entire PV installation may be cabled consistently with a single system. The pre-assembled MC4-EVO 3 (1500 VDC TÜV / 1000 VDC UL) is partucularly suited for module manufacturers and for installations with large cable cross sections. The original MC4 (1000 VDC TÜV / 600 VDC UL) has proven successful during the past 10 years in installations worldwide; it is available pre-assembled as well as for on-site assembly. Multi-Contact’s PV connector MC4 and the crystalline junction box PV-JB/WL have recently successfully passed the ammonia resistance test run by the DLG. In rural areas, solar systems are being widely used. PV modules on the roofs of barns and stables are a common form of solar installations. In this surrounding, the modules are exposed to harsh environmental conditions. With the MC4-EVO 3, Multi-Contact introduced a PV connector to the market which is especially designed for internationally operating module manufacturers. The MC4-EVO 3 ist the first connector worldwide to be recognized for both 1500 VDC TÜV and 1000 VDC UL. With these performance parameters the connector is able to meet new demands evoked by permanently increasing cable cross sections. By adding the MC4-EVO 3 connector to the original MC4 system, Multi-Contact broadens the portfolio by an automatically assembled connection solution which can be produced at low cost with consistant high quality. With double-certification 1500 VDC IEC and 1000 VDC UL, Multi-Contact’s PV junction box PV-JB/WL-H is suited for global use on high performace PV modules. The PV-JB/WL is a particularly flat-built box, which can be installed directly underneath the module frame. This eliminates the need to bend the connecting ribbons, saving valuable time in the installation process. Ribbon termination is achieved by clamping, welding or soldering. Multi-Contact’s new PV connector MC4-EVO 3, originally rated for 600V, is now UL recognized for a rated voltage of 1000V and fulfills the IEC standards for 1000V and 1500V (depending on the cable selection). More detailed information can be found under UL file no. E343181. Shortly after receiving the TÜV certification Multi-Contact’s junction box PV-JB/WL-H has now also been recognized by UL. The PV-JB/WL is available in a 10A and 12A version, and conforms to protection category IP65. The flat design of the box enables it to be installed directly under the module frame structure. This saves valuable time in the installation process, since it eliminates the need to bend over the ribbon conductors. Multi-Contact’s pre-assembled photovoltaic connector MC4-EVO 3 is now TÜV certified up to DC 1500V. The MC4-EVO 3 has been designed particularly for automated assembly, therefore enabling more efficient production processes. 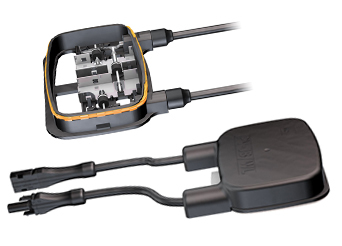 The compact connector with cables of cross-sections from 1.5 to 6mm2 is TÜV and UL recognized and intermateable with the original MC4. Multi-Contact’s pre-assembled PV connector MC4-EVO 3 has recently been recognized by both TÜV and UL. It is a cost-efficient connection solution for module manufacturers, as the connector is assembled automatically. It can be produced efficiently at high quality. The compact MC4-EVO 3 with cables in cross sections from 1. At the world‘s largest PV exhibition in Munich, Germany, this year Multi-Contact successfully continued the actions against illegal product copies. Legal action was taken against two distributors and one manufacturer of counterfeit products directly on-site. With two companies, an out-of-court settlement was reached. Illegal product copies deliberately mislead the customer.